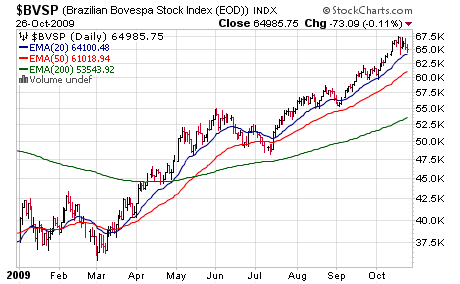 The Bovespa may top 85,000 by the middle of next year, he wrote. That represents a 31 percent gain from the close on Oct. 23. The index trades at 16.5 times estimated earnings, compared with 17.16 times for the MSCI Latin America Index, according to Bloomberg data. Earnings per share will likely grow 46 percent next year and 23 percent in 2011, meaning that forward valuations will remain steady even as the index climbs to 85,000, Graham wrote. A “baby boom” in the 1980s means consumers in their 20s are now entering the market with “credit volumes never before available,” driving up demand in Brazil’s domestic market, he wrote. The growth of the population may lift Brazil to the world’s third-biggest market for computers and telephones next year, Graham wrote. the country’s “financial stability” has led to 77 percent growth in bank accounts over seven years and 18 percent growth in the number of credit cards since 2001, the strategist wrote. Preparations for the 2014 World Cup and 2016 Olympic Games will likely speed up financing for needed infrastructure projects, Graham wrote. Brazil is seeing “some of the largest build-outs in the world underway in power transmission, pipelines, hydropower, and telecom,” as global attention from the sporting events puts pressure on the government to accelerate the pace of construction, he wrote. Latin America’s biggest economy is also at an advantage to other commodity-producing nations because it sells to “fast- growing” China instead of relying on sales to slower-growing markets in the U.S. and Europe, Graham wrote. However, in unfortunate news (at least for American visitors to Brazil) the real's appreciation (see Ben Bernanke's campaign above) has made a Big Mac an expensive proposition. The Brazilian real’s 34 percent, world-beating rally this year pushed up the price of a Big Mac in Sao Paulo above that in New York and London, a measure that would indicate the currency is overvalued. Buying McDonald’s Corp.’s flagship hamburger costs 8 reais in Sao Paulo, or $4.62, compared with $3.99 in New York and 2.29 pounds in the U.K. capital, or $3.74. While President Luiz Inacio Lula da Silva and Finance Minister Guido Mantega say the currency’s strength threatens exports and jobs and imposed a tax last week to curb the gains, analysts such as Goldman Sachs Group Inc.’s Paulo Leme says the real will continue to appreciate.